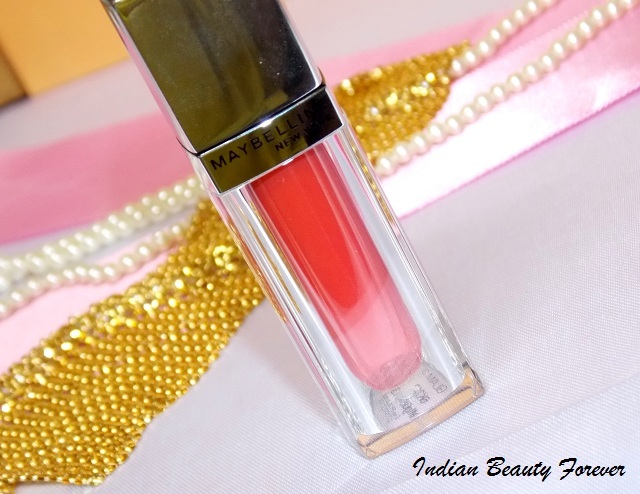 I am going to review Maybelline Lip Polish today. 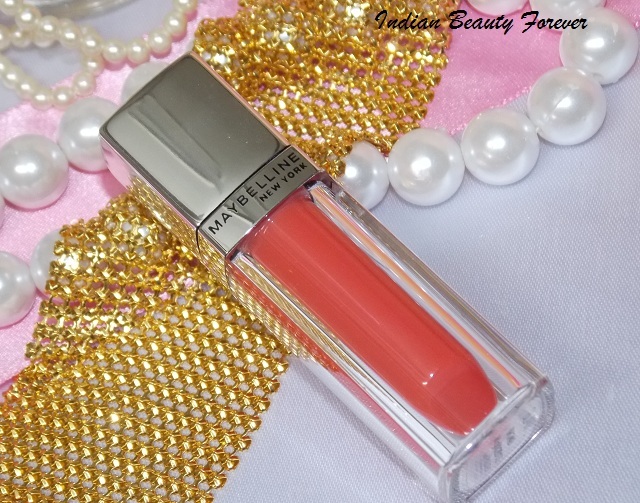 Maybelline has recently launched these lip polishes that can be said as a lip gloss only. They have been launched in around 15 shades and have been named as Glam 1, glam 2, or Pop 1, Pop etc. 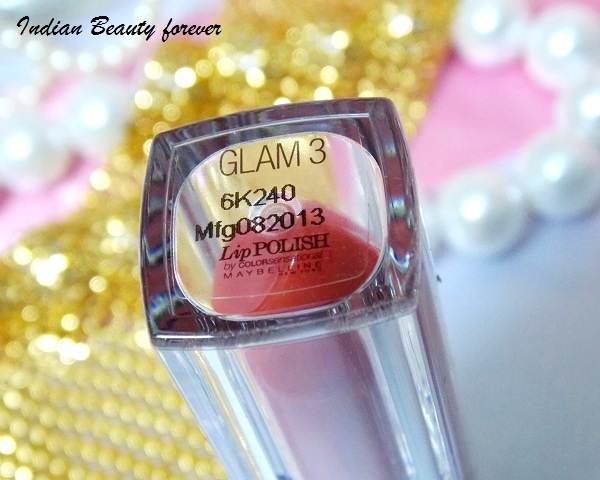 I will share the review of Maybelline Lip Polish in Glam 3. These lip polishes can be a great option for lip gloss lovers with a decent color on their lips and something that can feel very light. 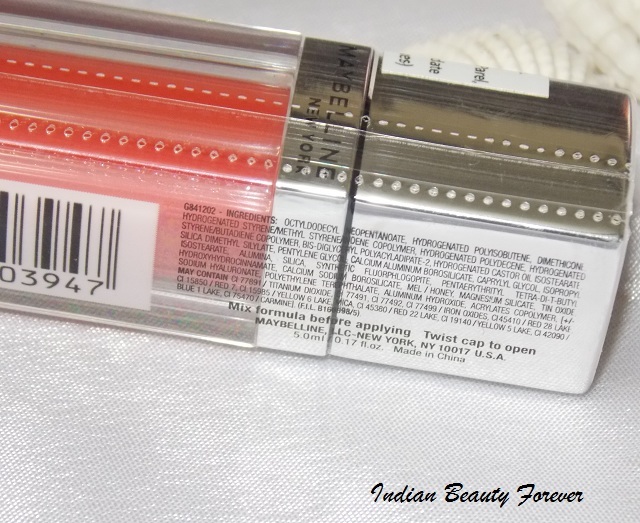 Price: Maybelline Lip polish is priced in India for rupees 450 for 5ml. Soothing balm and Honey nectar: Cares and soothes the lips. Honey Essence Oil: The highly reflective oil delivers a polished shine. Ultra-concentrated pigments: Delivers potent color. Brush: Exclusive smoothing angora brush delivers a polished, even application and smoothing sensation to lips. 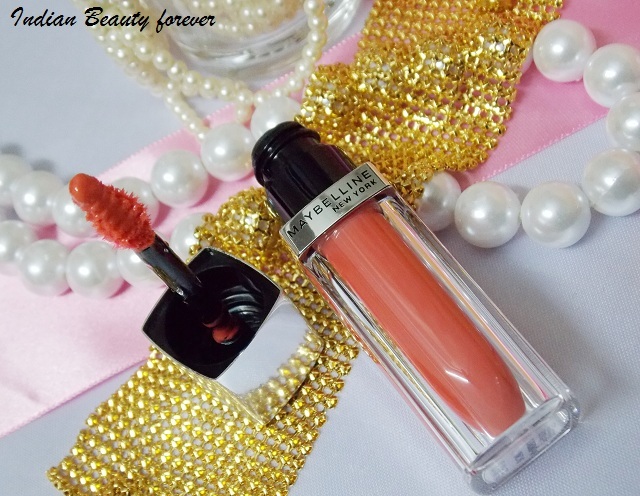 Experience: Maybelline Lip polish comes in a rectangular tube with a mirror finished cap. 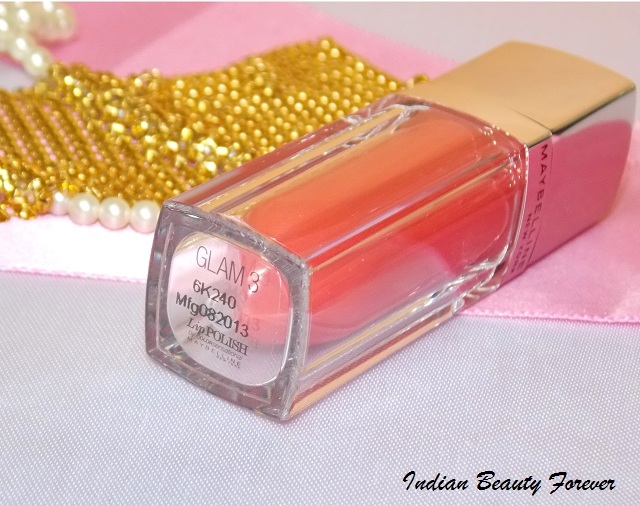 Visually, it looks decent but not like the one we have seen in L’Oreal Paris Shine Caresse lipcolor. They were just amazing. The shade name of these polishes are given at the bottom of the tube. Mine says Glam 3. 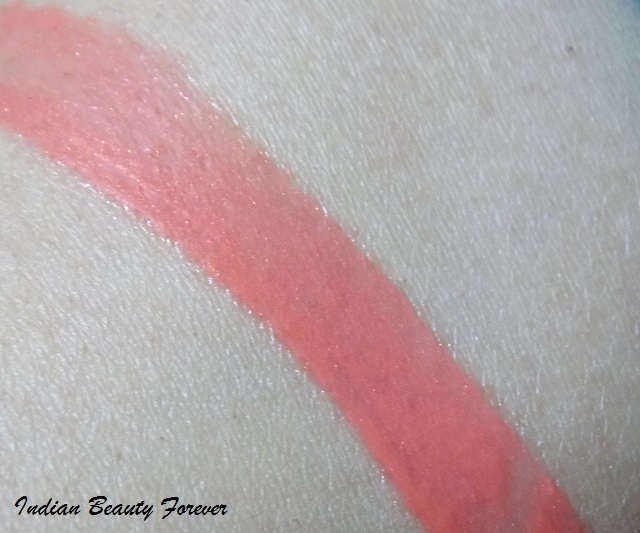 Glam 3 is a very juicy looking pale peachy color with pink undertones, though in the tube, it appears more orange. 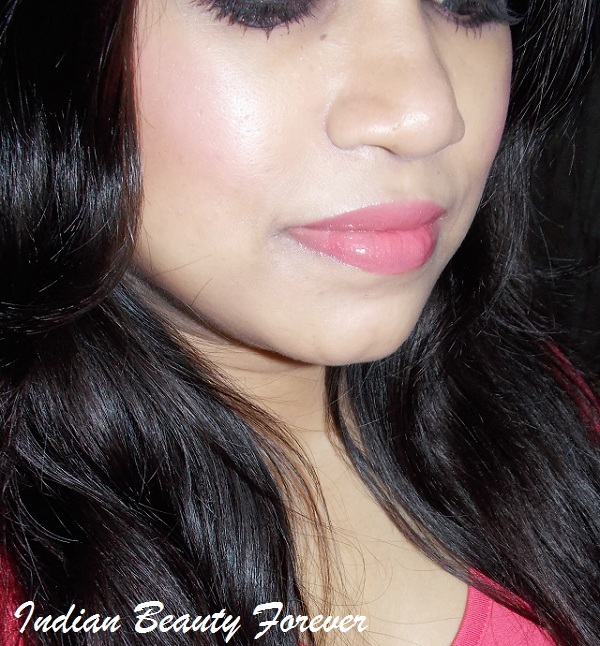 It’s a color that’s going to look flattering on fair to medium skin though for dusky skin, it may wash out slightly. As the shade lacks the sufficient warmth to go with duskier skin tones. But It’s not going to wash out badly like some shades can do. Very slightly! It’s brush is quite unique, something that I have not come across so far. It has tiny bunch of fibers sticking out and the shape is unusual too. But nevertheless, it helps apply the lip color beautifully on the lips. Feels very soft!! 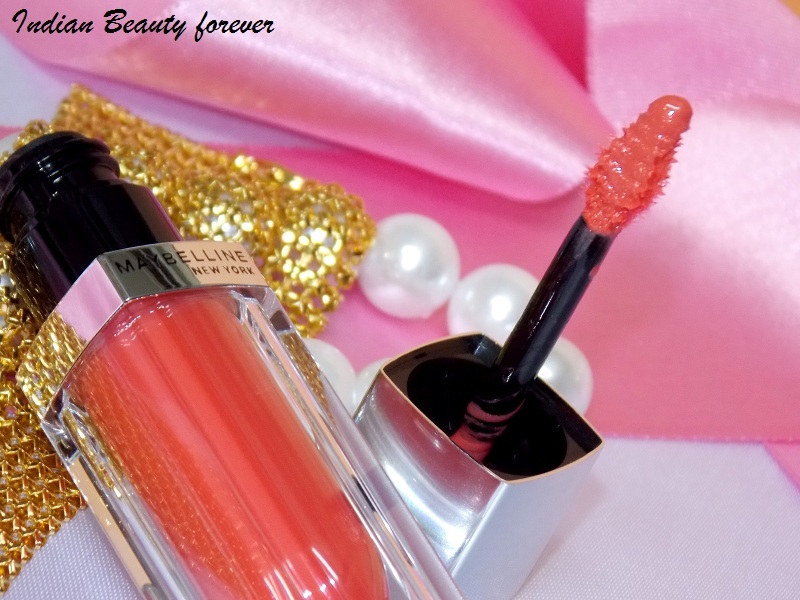 The Lip polish just glides on my lips like butter and is devoid of any characteristic fragrance. While I use it, though it glides like a dream, I can still see some patches. Patches are not like, as the lip color is not evenly distributed on the lips, but rather are observed as if the lip color got coagulated at certain areas on the lips. After a minute or 2, may be due to the heat, the patches are less seen, It seems as if the color has been melted on lips, resulting in better and even finish. Due to its buttery soft texture, it is bound to bleed a bit though not too much. 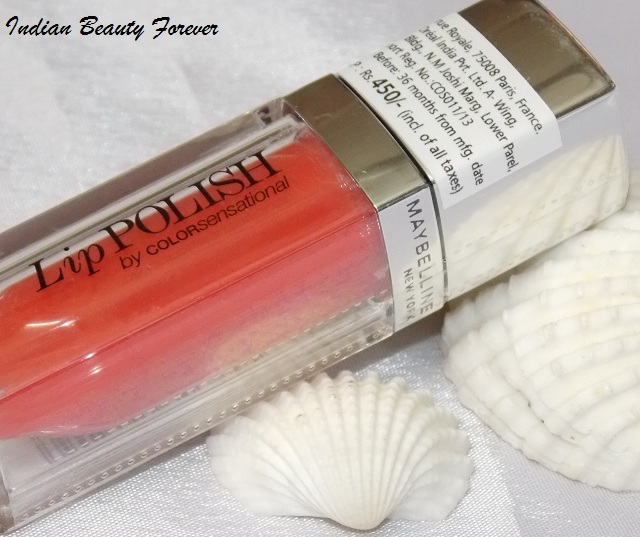 It has very fine micro shimmers in it, that reflects light to give more fullness to the lips. With this, I definitely don’t need the lip balms, credit goes to its hydrating formula. It stays for 2 hours at most on me and while I talk or eat or drink, it tends to get wiped off with leaving a very faint stain, that can also be seen as negligible. When you talk, this gets patchy and uneven. It can be used on its own or over your lipstick. Even to tone down your dark lipsticks you can use it as in like color mixing! 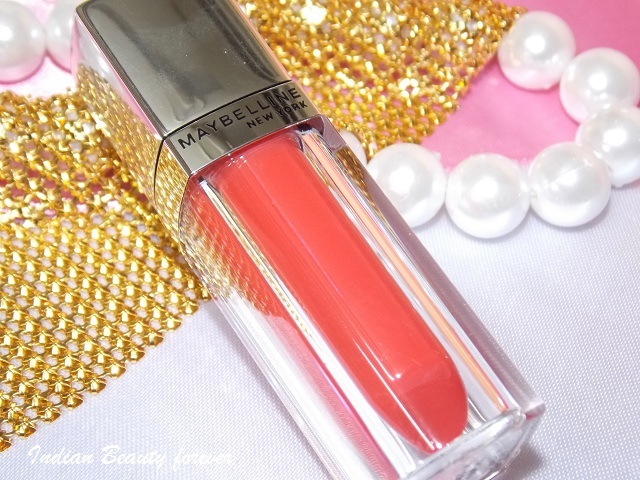 I like this Maybelline lip Polish glam 3 shade but wished it would have not been patchy and the price is a little high for a lip polish or lip gloss. Considering everything like packaging, brush, formula, pigmentation etc, I think 300-350 INR would have been an ideal price for this polish. You can check this smokey plum makeup Look tutorial by clicking the link. 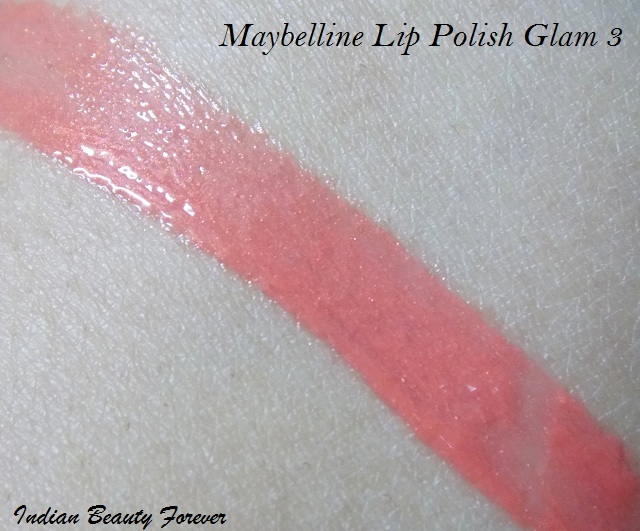 Take: Maybelline lip Polish glam 3 is a beautiful peachy pink shade that looks more orange in the tube, will suit fair to medium skin tones better than duskier tones. 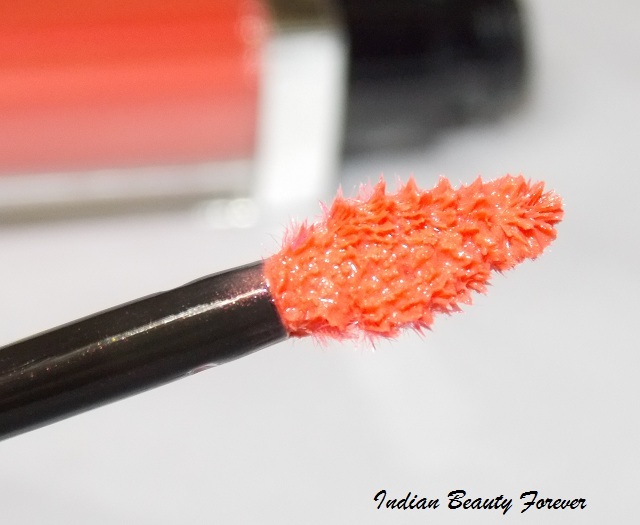 Its decent pigmentation, buttery smooth formula makes it a decent lip product, but looking at the patchiness and low staying power, the price should have been lesser. If you don’t mind the price and staying power go ahead, they are available in more than 12 exciting shades.